Welcome to our Blog. Where you'll find the details of what our products can do for you. Red clay is the dominant soil type in the southern United States but can also be found as far north as Pennsylvania and even western states. Red clay stains occur after heavy rains when water carries the clay deep into the pores of the concrete, brick or stucco. Home foundation walls are often susceptible to this via splash build up, but even the simple act of walking on a concrete driveway with muddy shoes will do its damage. Powerwashing alone does not take the red dirt stains out. Why are red clay stains so hard to clean from concrete and masonry? Possibly because what gives the reddish color of the dirt is iron oxide or better known as rust, which is highly insoluble in water. In fact, iron oxides are often used as inexpensive earth tone pigments in coatings, paints and colored concrete. 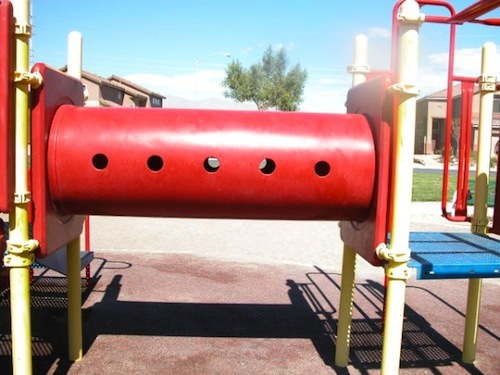 The process to remove red dirt stains is a chemical (cleaner) and mechanical (power wash) combination. An acidic based cleaner is more powerful because it will bubble up the red clay that is deeply imbedded in the concrete. Yet, one has to be careful as not all acid cleaners are equal. Straight acids (or highly concentrated) may be too powerful and actually burn or harshly etch the concrete. If an acid cleaner is diluted too much, then its not going to break the bond the iron oxide has made to the masonry or concrete. Our balanced Red Clay Stain Remover is buffered with water and surfactants to only micro etch the concrete, thus removing the red clay but not adversely affecting the surface. Apply the Red Clay Stain Remover using a hand pump sprayer, let sit for 3 to 5 minutes and then power wash off. 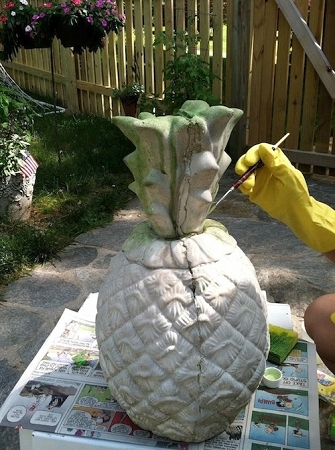 It's important to use a power washer so that you move the clay completely off the surface. Otherwise the red clay may resettle in another area. 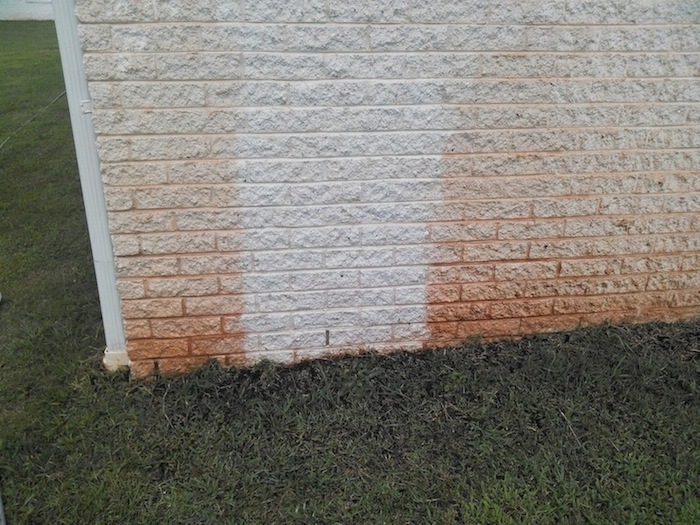 The picture below (compliments of Detail Pressure Washing in West Union, SC) shows our cleaner taking off red clay stains from a brick foundation wall. After cleaning the surface, consider using our Trojan Masonry Sealer that will permanently penetrate the surface without changing the look of the exterior. It will make future cleanings much easier as the red clay cannot absorb into the pores. The American Society of Civil Engineers' Report Card grades America's Infrastructure maintenance initiative a D+. The organization estimates that $3.6 trillion would be needed to invest into U.S. infrastructure by 2020 just to bring the country's support systems to an acceptable B grade. Faced with the problem that most county and state governments do not have the finances to repair all of their roads and bridges, some local governments are looking for alternative and less expensive solutions to protecting their existing concrete surfaces. When our parent company formed in 1993, we like many manufacturer's, produced topical coatings. But as with any coating system, they eventually wear away and the consumer is forced to reapply, thus becoming caught in a costly maintenance cycle. So we decided to create a penetrating sealer that would become an integral part of the original surface. The result is our Trojan Masonry & Concrete Sealer. 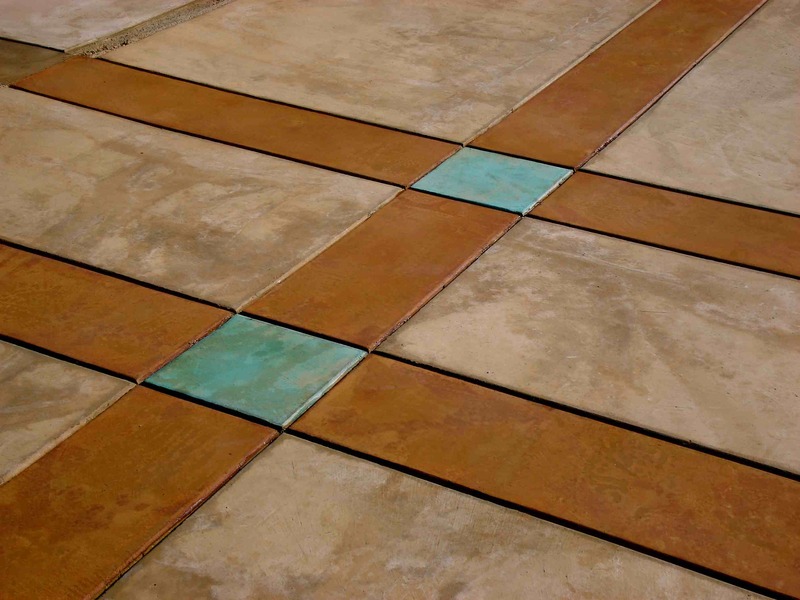 The unique polyester component of the sealer, in turn, hardens the substrate to help prevent future surface degradation of the concrete or masonry. The product is so different from other sealers that the Construction Specifications Institute (CSI) provided the Trojan Sealer is own category: 07 19 29 Penetrating Polyester Water Repellents. This recognition appeared in CSI's 2016 MasterFormat publication. 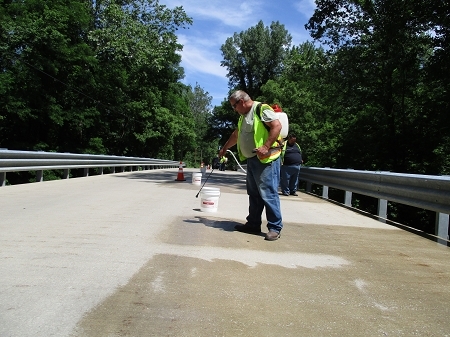 In 2011, the Tippecanoe County Highway Department began looking for a product to help preserve its concrete bridges. Located in the freeze/thaw zone of the U.S., Indiana’s winter-month temperatures can fluctuate daily above and below 32 degrees Fahrenheit. If rain falls during the warmer part of the day, it gets absorbed into the concrete. Yet as the water freezes in the pores overnight, it expands about 9 percent and begins to produce pressure in the concrete. Once the pressure exceeds the tensile strength of the concrete, it will cause expansion, cracking and crumbling of the concrete over many freeze/thaw cycles. Stones such as limestone and sandstone are often included in the construction of homes and buildings. 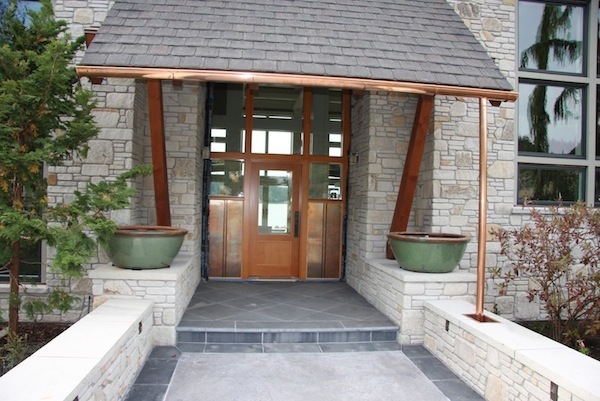 They are used for the exterior veneer of the house and even walkways. Yet because of their very porous nature, the soft stones are also subject to weathering (wind/rain/salt water) quicker than other substrates. Salts and deicing chemicals (used in winter areas) will further hasten the degradation of stone walkways. Our Trojan Masonry and Trojan Ultra Sealers will densify and increase the stones longevity as well as waterproof the surface permanently. In 2005, the US experienced the most active Atlantic hurricane season in history with 28 named storms. As our manufacturing plant is located in Melbourne, FL, we decided that year to develop a roof coating that would help reduce residential roof damage caused by wind shear. Specifically, we wanted to create a non-toxic coating that would 'glue down' asphalt shingles and thus prohibit wind lift up. The coating had to be UV resistant and yet provide similar colors to the most common shingles available. At the time, there were few coatings designed for asphalt shingles and those that were on the market were generally only obtainable in white. 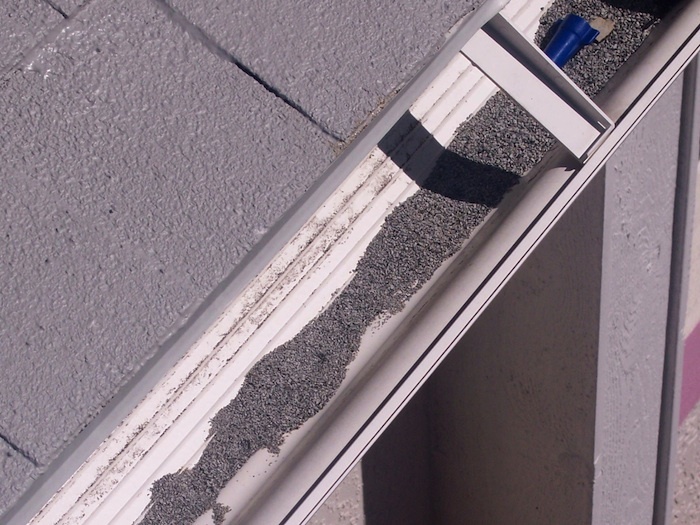 The below picture shows shingle gravel that has collected in the gutters. Colored Shingle Roof Coating was applied to prohibit future shingle degradation and save the roof from replacement. 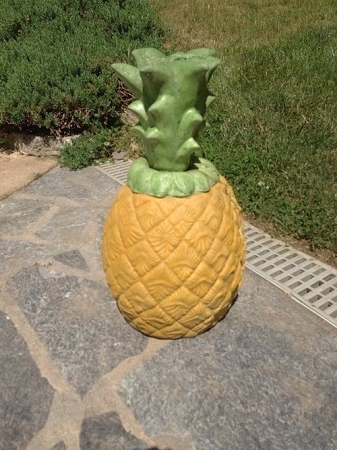 Concrete garden statues are available either natural (no color or sealer) or painted. Yet over time, as the statues are exposed to the elements, they become dirty, mold/mildew stained or the paint begins to fade and peal. Our Trojan Color Sealer and Trojan Masonry Sealer can help fight against the detriments of weathering. 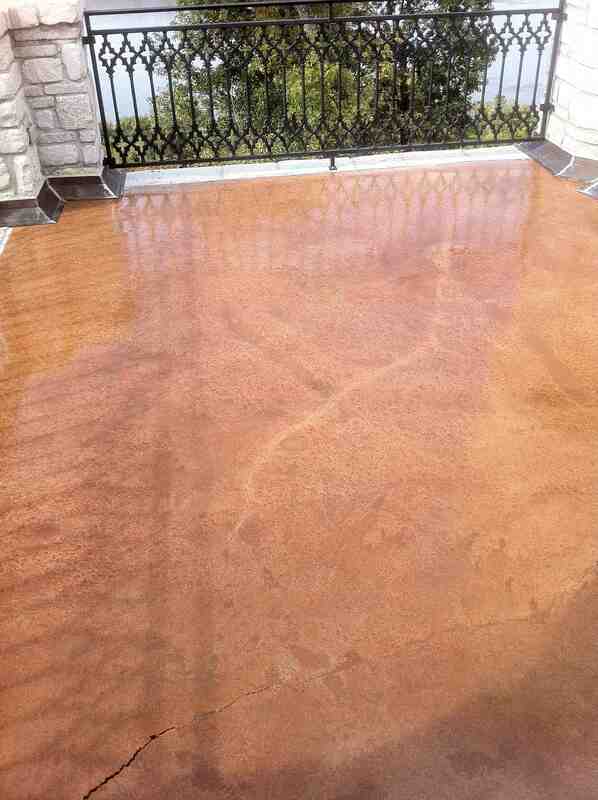 Trojan Color Sealer is not a paint but a water based sealer and stain system that absorb into the concrete's surface. The non-toxic polyester sealer locks in the UV resistant pigmented stains to preserve the color. Below are pictures using our Amazon Green and Harvest Gold colors. The (after) picture was taken one year after application. Unlike acrylic, latex or oil based paints that sit on the surface, Trojan Color Sealer does not peal or chip away as it is not a coating. Trojan Masonry Sealer is a clear, penetrating non-toxic/non-gloss sealer for those that want to maintain the natural (uncolored) look. Trojan will provide protection against freeze/thaw cycle, whereby concrete begins to crack as water freezes overnight in the pores of the substrate and then expand during the warmer day. This constant expansion/contraction will break up masonry & concrete over time. The Trojan Sealer will also help reduce the mold & mildew growth as the sealed surface will dry much quicker after a rain, thus taking away the wet environment that allow spores to multiply. Using eco friendly products during the restoration and preservation of historic homes and buildings is paramount when dealing with older substrates. As masonry/stone ages it becomes softer and thus more brittle. Power washing with very high pressure and harsh chemical cleaners can only add to further degradation. The below pictures are provided by Robert Morgan & Company (Littleton, NH) who specialize in church steeple and building restoration. 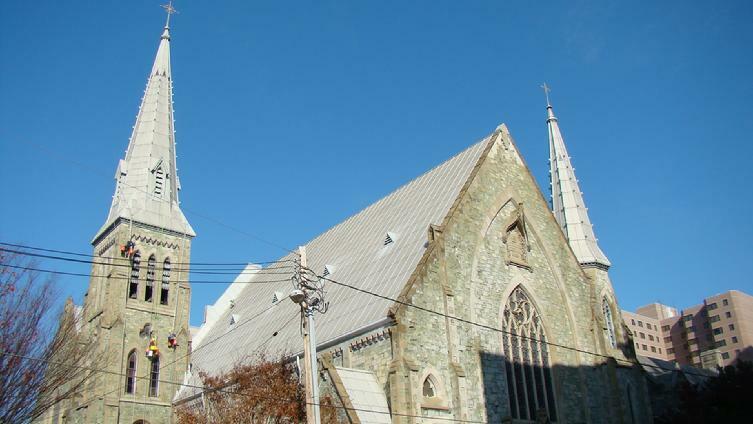 This particular project is of the Grace Methodist Church in Wilmington, DE and shows Robert Morgan & Co. using our Trojan Masonry Sealer to seal the exterior once they repaired it. » Penetrating Sealer - As Trojan is a water based, penetrating sealer it does not change the look of the surface by making it shiny or darken the stone. This is very important for historic preservationists who require the building to look exactly as it did when originally built. » Densifier - Trojans unique polyester polymer content will fill the pores and actually increase the strength of the stone/mortar, thus preserving the building and guarding against future deterioration caused by weather. » Environmentally Safe - Unlike some sealers that are toxic and etch glass, Trojan Masonry Sealer is 7 pH (like water) and inert in that it will not harm or react with anything. Since it is low VOC (volatile organic compounds) it can also be safely used indoors without odor. Trojan Color Sealer can be applied to various porous surfaces, such as, indoor/outdoor concrete, or even faded brick pavers to enhance/rejuvenate the color and provide a sealer in one product. The below picture submitted by SealGuard of St. Louis shows a unique instance where SealGuard had to repair the deep crack on the balcony as well as color seal the concrete. First SealGuard ground the surface. Then they repaired the cracks deep in the fissures, so the patch would not be visible. Afterwards, they applied the Trojan Color Sealer (Cordova Tan). As Trojan Color Sealer is a true penetrating sealer, it is not a high solid content product to bridge the cracks. Therefore SealGuard then applied a clear polyaspartic as a top coat to ensure no water seeped through to the floor below from the fissures. As Trojan Color Sealer is extremely low in VOC (volatile organic compounds), it can safely be used indoors without any bad smells or off-gassing odors. 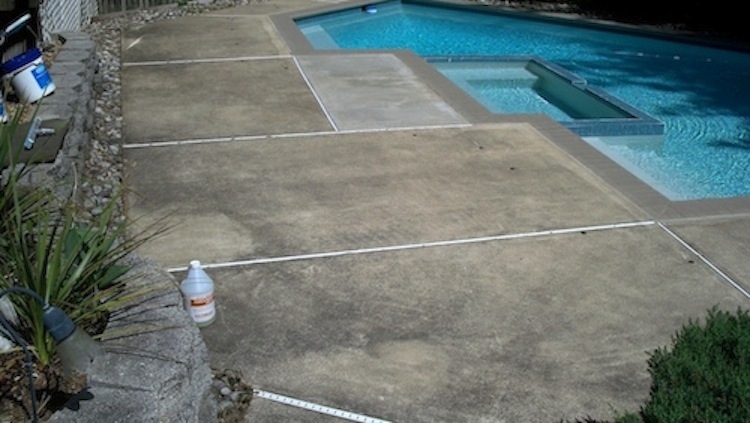 Algae Mildew Cleaner and Trojan Masonry Sealer are the two components needed to clean and preserve your pool deck. 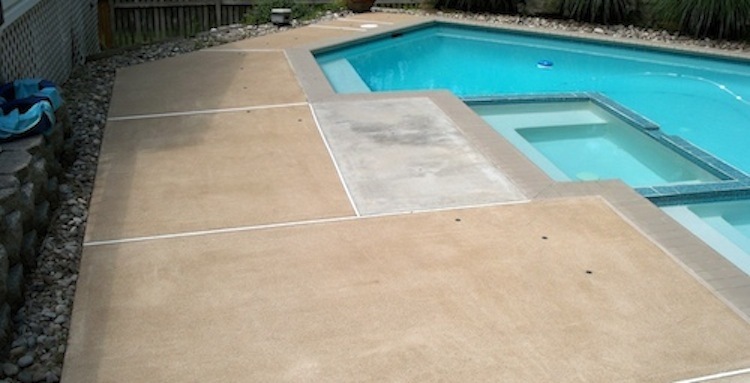 Over time, concrete pool decks tend to blacken with dirt and mildew. The black mildew is even more prevalent in areas of high humidity and shaded regions. Concrete is very porous and therefore holds in moisture longer, providing a perfect petri dish for mold and mildew to grow. Spray on our Algae Mildew Cleaner with a hand-pump garden sprayer, agitate with a broom brush and power wash the surface to bring back the original look of your pool deck. Graffiti is an ugly blight that affects many city and suburban neighborhoods. Hazardous chemical solvents are often used to 'clean' the graffiti off, yet there are more eco-friendly products that can do the job. The Erase Cleaner is a non toxic graffiti cleaner when used in its concentrated form. This product is actually a 'two in one' system in that it will dissolve graffiti, mastics, glues & latex paints when used straight out of the bottle, yet if you cut it with water, it becomes an excellent degreaser that removers all types of oil stains and residues. 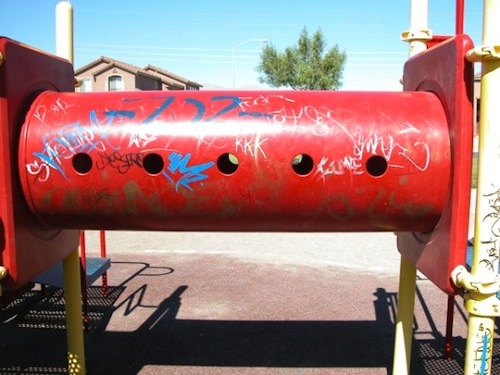 The below pictures using our Erase Cleaner are provided by Wipeout Graffiti Company based in Las Vegas, NV. Concrete countertops are becoming a larger part of the green building/restoration business because it is a sustainable building material, using locally produced and often recycled components. Manufacturers also have a greater ability to create various colors and shapes to fit the needs of clients wishing for more personalized designs. The Trojan Masonry Sealer is often used on these colored concrete countertops to fill the pores and increase the strength of the substrate. Our concrete sealer's non toxic aspect is especially important for kitchen concrete countertops where food preparation occurs. 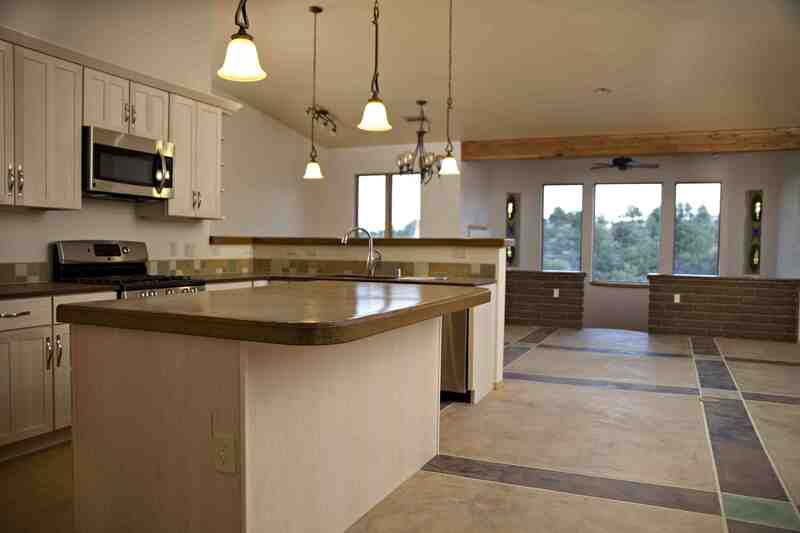 The below photo of Trojan Masonry Sealer applied to this colored concrete countertop was provided by Mark Bighley Construction from Silver City, NM. Note: Our concrete sealer provides a matte finish for the organic look. Yet if the client desires a shine, a non toxic acrylic, urethane or wax can be applied over the Trojan Masonry Sealer. Our concrete sealer will allow a superior chemical bond to these topical sealers with the added value if the topical sealant wears away, Trojan is still protecting the concrete. Although the Trojan Color Sealer is an all in one stain and sealer system, we do have many Acid Stain Professionals that use the clear Trojan Masonry Sealer after applying their acid stain (once pH neutralized) to the concrete floor. The below photo of Trojan Masonry Sealer applied to acid stained concrete was provided by Mark Bighley Construction from Silver City, NM. Note: This project photo using our sealer was part of a passive solar homes article from motherearthnews.com (3rd picture in gallery). Why do acid stain professionals use Trojan Masonry Sealer? Unlike topical sealers (silicone, acrylic, polyurethane etc), Trojan is a water based, penetrating polyester concrete sealer that does not leave a surface residue. It instead fills the pores of the substrate leaving a matte to very low gloss (only on indoor, hard trowelled concrete) finish. Although topical sealants provide a nice shine they also are a maintenance issue in themselves as they easily wear away, especially on outdoor projects where weather, UV and walking/driving takes its toll. Topicals can also be slippery when wet, unlike Trojan, which will not change the friction coefficient of the surface. Our sealer will also not wear away as it hardens and binds the surface into one solid mass. Bradly Lewis Home Maintenance Inc. of Portland, OR is an applicator that uses our Trojan Masonry Sealer with his services. Below is an excerpt from his website, which provides an excellent description of why sealing your driveway with a penetrating concrete sealer is important. Sealer seals driveway by providing a harder surface with fewer pores which makes cleanings easier. Drip lines on driveway by garage door from gutter water eroding the concrete. Hardening the concrete with a sealer and keeping the gutters clean helps keep the concrete keep a more uniform appearance for longer.